Don't sacrifice big rig features just because you want to operate QRP! Whether hiking in the mountains or taking a leisurely stroll through the park, the IC-703 is the "Real Deal" HF QRP rig! Built-in is an automatic antenna tuner and DSP*, plus there's a newly designed PA circuit to provide a clean 5W signal with only 9.6V DC. 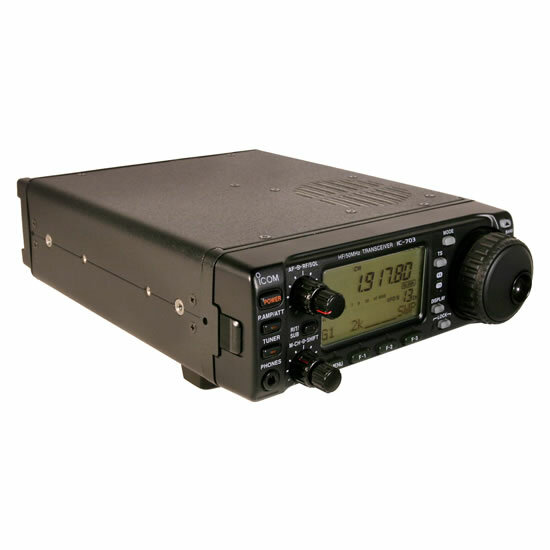 The IC-703 also supports true QRP operation with enhancements of features and components to be very efficient to prolong operation of the battery pack. The optional BP-228 battery pack allows up to 7 hours of operating enjoyment. * Optional UT-106 required depending on version. HF how it should be: Compact and Portable! Designed by hams, for hams! 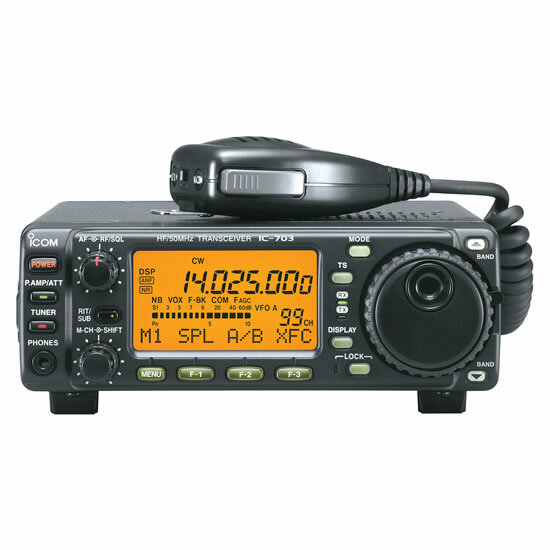 Take your hobby with you into the great outdoors with the LC-156, Icom's Multi-bag '703 carrier. The LC-156 offers plenty of room to store and protect the gear you'll want to bring along for hours of fun operating the bands. It's the perfect way to combine a ham's love for both the hobby and the great outdoors! Icom's DSP technology allows you to pick-out the weak signals! DSP capabilities give you tools to reduce interfering signals, or just to dig weak signals out of the dirt. The noise reduction separates desired signals from noise and reduces the noise components for a clearer received signal, while the auto notch tracks and eliminates interference from a solid tone signal. The newly designed PA unit and antenna tuner, specifically designed for the IC-703, extends operating time by reducing the voltage and current consumption. The antenna tuner utilizes low current latching relays to cover 160-6m. While on a 9.6V DC source or less than 11V DC, many functions of the IC-703 are controlled by the microprocessor to extend the battery life. To extend battery life, the back lighting for the display and buttons auto-matically turns off when unused. By using power efficient components for the PA, antenna tuner and the PLL circuits, the IC-703 is designed for maximum efficiency at 9.6V DC. 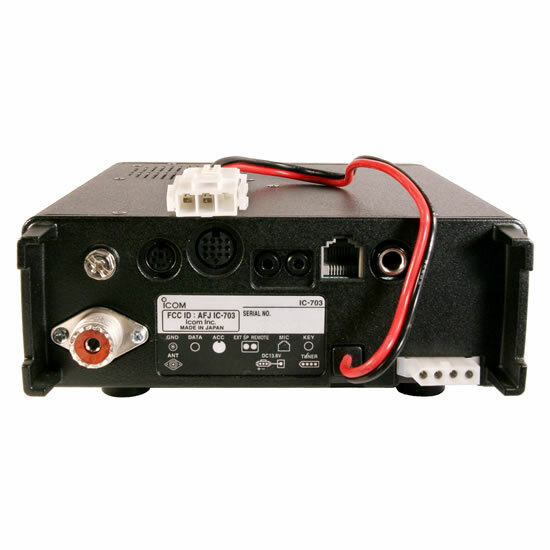 When using the optional BP-228 battery pack, the IC-703 automatically switches into low current mode, thus allowing operation time of up to 7 hours*. While operating on high power, or 13.8V DC, the IC-703 can safely operate at a full 10W even if the power source drops to 11V DC. * Tx:Rx:Stand-by =0.5:0.5:9 in SSB mode. Whether safe indoors or exposed to the cold temperatures outdoors, the IC-703 will be right on frequency with the standard ±0.5ppm TCXO. The IC-703's receiver performance is in the same class as that of high end base stations: 0.16µV at 10dB S/N for 1.8 to 30MHz bands and 0.13µV for 50MHz at 10dB S/N (in SSB and CW modes). Operate while hiking without fumbling for the controls. Use with the optional OPC-581 (3.5m; 11ft) or OPC-587 (5m; 16ft) separation cables to remote the control head where its easy to see and use, allowing the compact body, measuring only 167(W) × 58(H) × 200(D) mm* and weighing 2.0kg, to be carried out of the way. 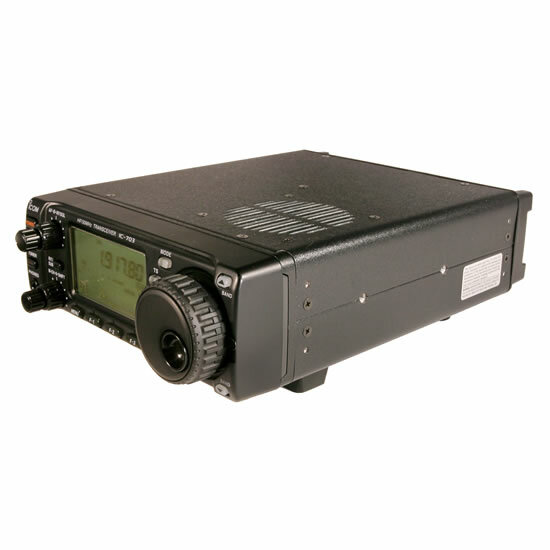 The IC-703 has a built-in CW Memory Keyer with three memory locations and up to 50 characters per memory location. Other keyer features include a variable CW pitch control (300.900Hz); operation with a bug; iambic paddles; or straight key. All these functions are available even when in low current mode. Utilizing the TRUE RTTY mode, FSK, the IC-703 generates the tones internally for the cleanest possible signal on the band. Also, whether operating FSK or AFSK data, you can tweak the IC-703 to be the perfect portable RTTY machine by adding the optional FL-52A filter. The 455kHz IF allows you to upgrade the standard 455kHz filter, FL-65, to improve your selectivity by installing an optional filter into the filter slot. IC-703's SWR graph bandwidth is adjustable from 10/50/100/500kHz.